The STUMPscorcher - two Tamiya icons in one! I doubt anyone here would argue that the Sand Scorcher is without a doubt, the most iconic RC kit that Tamiya has ever made? Way before I realised it had so many metal parts, scale dampers and a beautifully detailed [hard plastic] body, it just looked so darn real - sitting there on the shelf, in Betties circa 1981... three times the price of anything I (or more accurately my parents) could ever spend on a 'toy'. 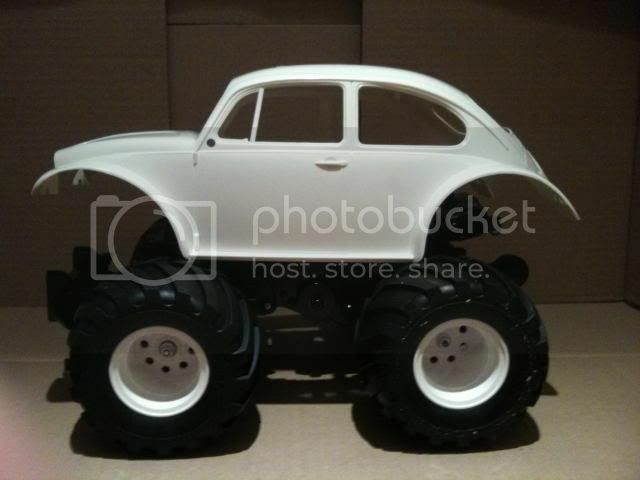 If you've seen my showroom, you'll see I essentially satisfied that original craving back in 2009 when I built my 'Fro-Sco' - using a Frog/Brat chassis, with a Blitzer Beetle shell... typically just a year before Tamiya re-released the 2010 Scorcher in all it's blister-packed, cast alloy, new-car smell, glory! I was sorely tempted to buy an SRB back then, just to enjoy the build - but at the same time, knew that trying to properly replicate box art was not something that had ever really inspired me, and that I actually preferred both customising [the shells], and as importantly, the physical challenge of re-engineering something, and fundamentally - making something unique. It was also around this time that I built the original STUMPkin - the ba5tard love-child of an old Midnight Pumpkin shell I'd had since the late 80's, and a brand new Wild Willy 2 kit chassis... and it was then began to fully appreciate the joy driving the WR02 chassis - it is awesome fun! I've always loved Willy of course (no tittering at the back there please!) and more recently I have finally embraced the Willys shell in building the Nailer Scaler - since I never felt the original Jeep body sat particularly well on the Wild Willy 2 chassis, that it was somehow just perched on top, rather than fully integrated? Anyway, that rather longwinded introduction is really just to set the scene for my latest build project - yep, actually one with wheels this time! What if we had a Sand Scorcher that could do wheelies?! Yes, I know what you're thinking - this is going to need some drastic surgery if it has a hope in he-ll of ever going together! 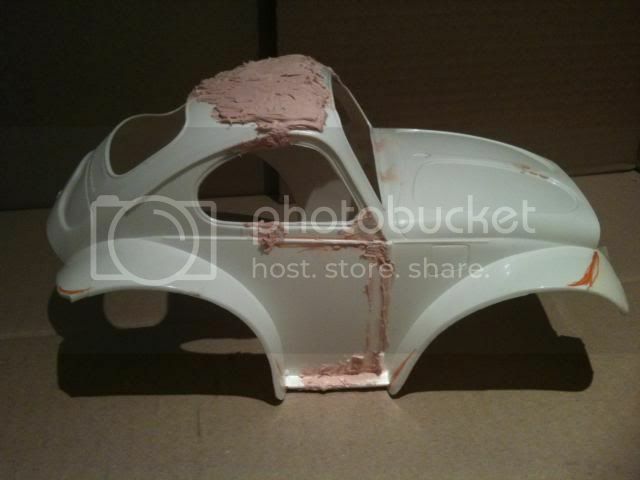 Taking a Dremel to a £40 body shell was an act of faith - especially late at night! But I was pleased how it actually went together - I think with a little work from the heat gun around the roof, this baby is going to work! By the way, I also apologise for using the term 'btw.' above, I realise I am not writing all this in a text... to a fourteen yr old. Dang, did it again. 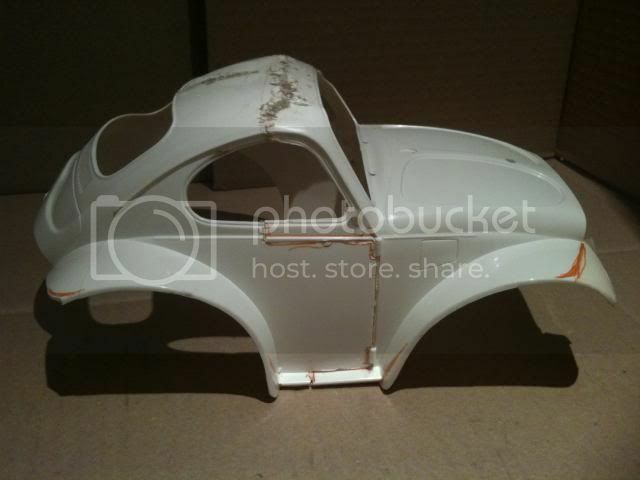 Not only do I think the proportions of the car are going to look fantastic once the shell is fitted to the chassis, but rather fortunately, the reshaping of the cabin area means the interior plate from the Holiday Buggy (that I had in my spares box), fills the inside of the car perfectly! And of course Willy has to be behind the wheel of this one! Less is more as they say, and this one is going to be all about the driving! Thats looking sick (apologies for that teen term too lol) beyond belief. 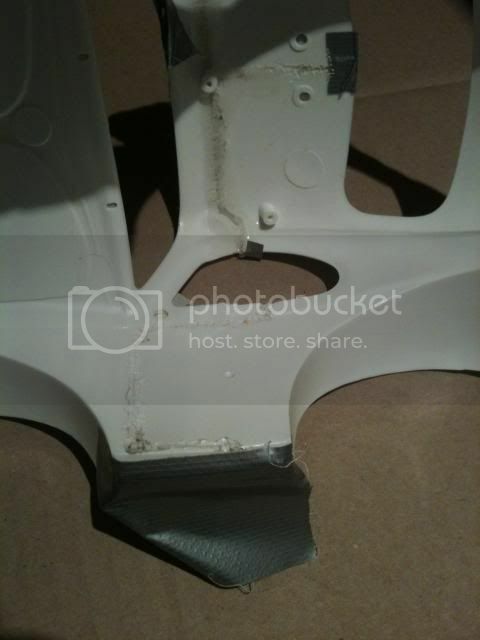 Great vision Jenny, did you wheel cut in the Dremel? A good way to cut this media too is a Zona razor saw, you get such fine clean cuts, and can literally use them to score along your cut line, till you get a decent groove to actually use a sawing action. What are you using to sculpt in the roof after forming it? Fantastic concept! This is going to be stunning. I want one! Hi Ralphee - thanks for your kind words, that's totes amazeballs! Because this (the first one x) was always going to be a bit of an 'experiment' to see where the cuts needed to be made, I wasn't going to be too precious about having to use a bit of filler/glue here and there... but I hope to ultimately have a template for subsequent versions if it works out. What I am hoping is that using my heat gun to soften the area around the top the door frames (note. there is currently 4-5mm discrepancy between the front and rear portions, as the original roof is tapered towards the front), everything should like up pretty well, which is why I've left a bit of overhang for the moment. Magicsculp for the filling Jenny, think your US based? Its easier to get it in the US too. 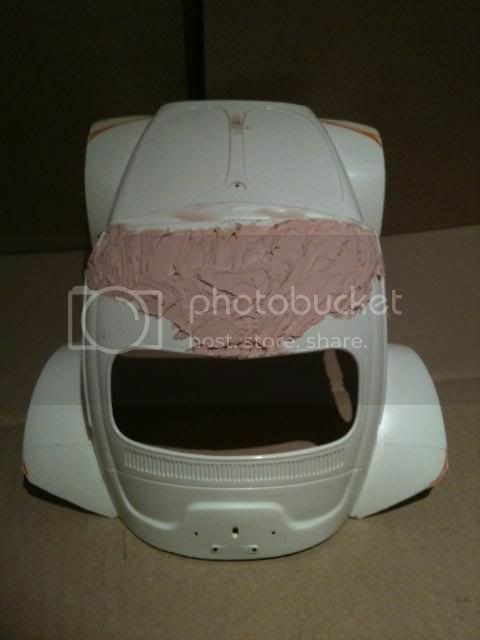 Its epoxy based, but once mixed, use water to soften, and you can really sculpt this stuff till your happy, you can get to the point where you will use a sponge to smooth it all out wet, leaving way less sanding once cured overnight, great stuff as long as you don't roll her about too much, but this stuff should work fine, and look very "dope" once smoothed out with fine grit! Edited the product, it turns out the name has changed! Nice Concept Jenny . Personally I think the way to do this is to do a chop top first . 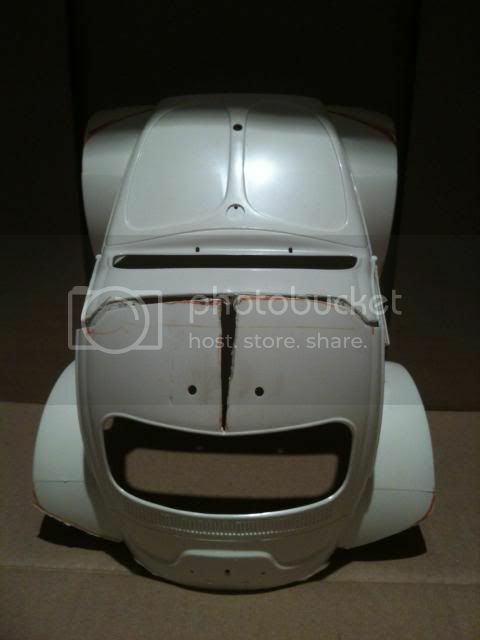 As you can see the rear of the roof is actually wider then the front on a Beetle . 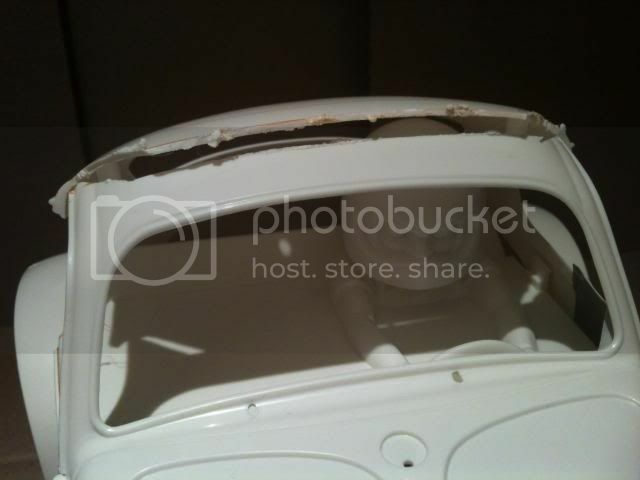 I would make the first cut as you have in line with the front of the sunroof and the second all the way across the body where the rear door edge falls . However I would then completely remove the remaining rear section of the roof by cutting along the topline of the boot lid and extending those cuts so they line up with the the bottom of the rear window . Doing it that way you can angle the roof downwards to line up with the curve of the remaining front roof section . 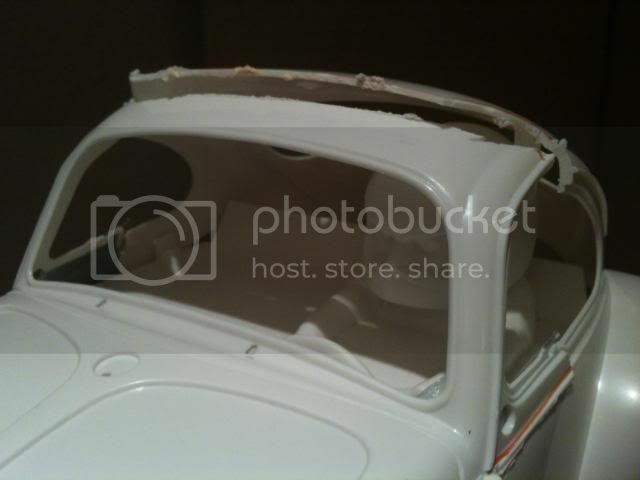 All ( lol ) you would then need to do is reshape the rear window and styrene / fill a new in fill section of the rear pillar . Just my thoughts and as they say there's more that one way to skin a cat . BTW I helped a mate do something very similar with a 1:1 Mini some years ago . I remember that getting the roof profile to look 'right' was a real badword of a job . You're a brave lady chopping that much out of a shell but if anyone is capable of pulling this off it's you! JennyMo, I suggest you to use my friction welding technique for this body. You will not need any glue and the body will come back one piece as magic. Hi Max - yes, I saw that and was very impressed - do you have the link to it again? Great to see you taking your "Stumper" idea into Baja-land too JennyMo! 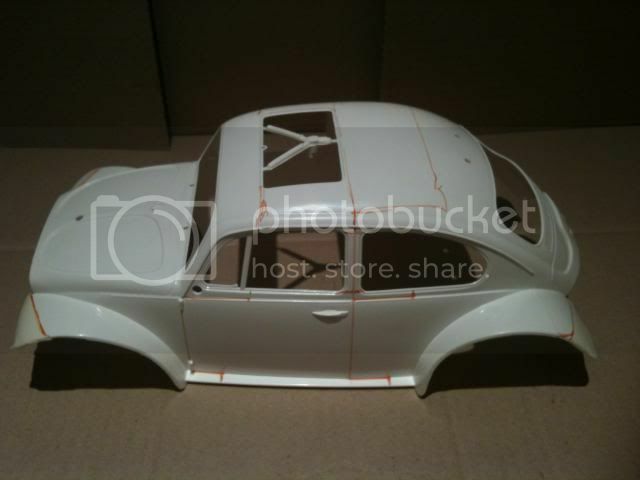 Looking forwards to seeing how this turns out - I've seen a couple of 1:1 beetles that have been shortened like this - they look very cute (plenty of pics on google). This one is going to look nuts with those wheels though! 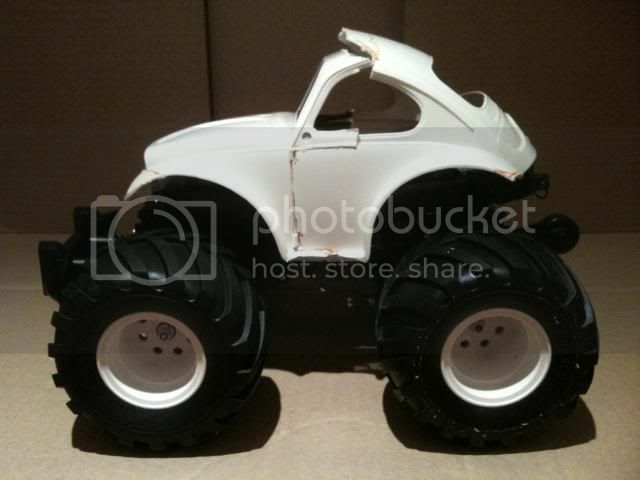 I could have donated a shell for this, I have a bug shell that is beyond my repair but I am sure you would work wonders with it. If you need any more shells, put a shout out. 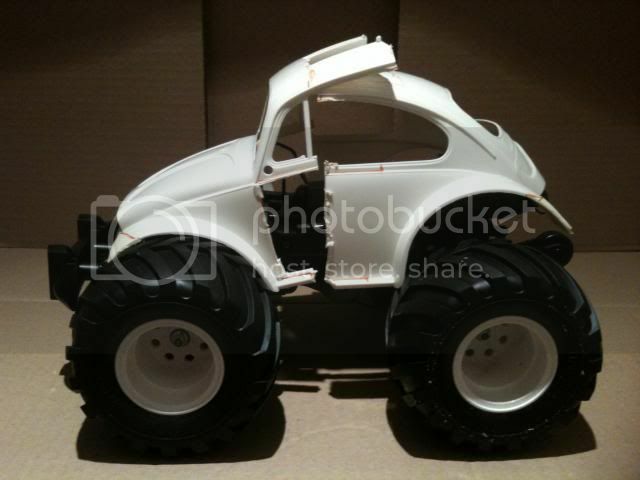 A few years ago when I was an active member of a fullsize beetle, buggy and baja club, one of my clubmates had a Sand Flea - a shortened, doorless baja bug that looked very much like this. Even though it only had a 1600TP engine, it could perform sustained wheelies with ease. Lotsa fun! Mutual love and silliness all round here! Yes! - I loved that photo you posted up on Mokei's thread - stick it up here too if you can, it is very much what the STUM-SCO is going to look like I feel! This isn't my mate's one - his was white, with a slightly different cage arrangement. 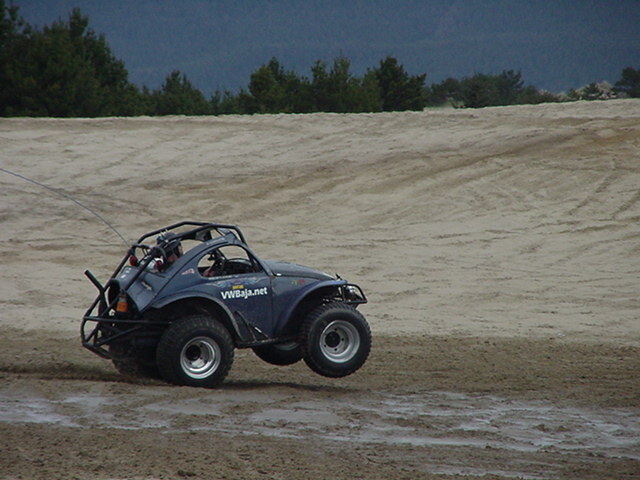 However, as with most custom vehicles, every Sand Flea is different. There is plenty of scope for individual customisation. The crazy thing is that picture could be a 1/10 or a 1/1 - with that whip ariel, it could be RC! 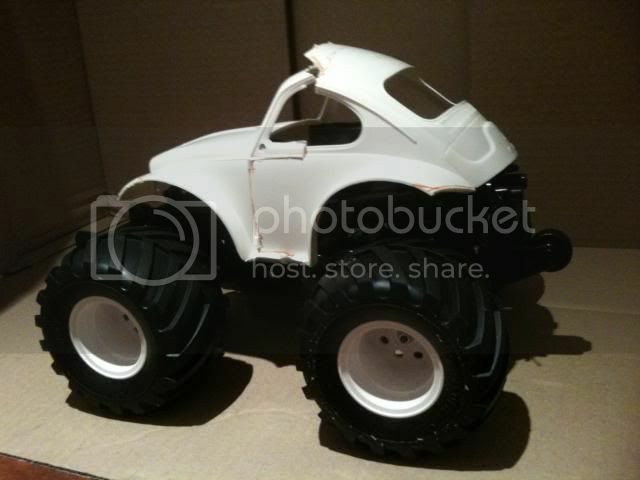 In fact, when I found the picture on google images I thought it *was* RC and was surprised when I realised it was real! Ha! I'm amazed how much the STUMPscorcher is going to look like this! - presumably they had to cut the roof off that 1:1 so you could get in and out?! Certainly that was one option I considered (as BromVW suggested) - and either reshape/model with styrene as required, or even simply leave it open as a convertible - particularly as I'm going to build a full interior for this one, and no doubt Willy will have a load of scale accessory junk in there! However, I also want to retain as much of the Sand Scorcher silhouette as possible, so for the time being, will press on with a hard-top version, and Willy will just have to wiggle himself in and out of the rear window or something - or else live in there and be drip-fed as Kev The Rev suggested! Obviously this works better the closer the original cuts are to each other... and where there was the odd gap, I bridged/filled that with Araldite Rapid epoxy (as you can see in the roof section above). 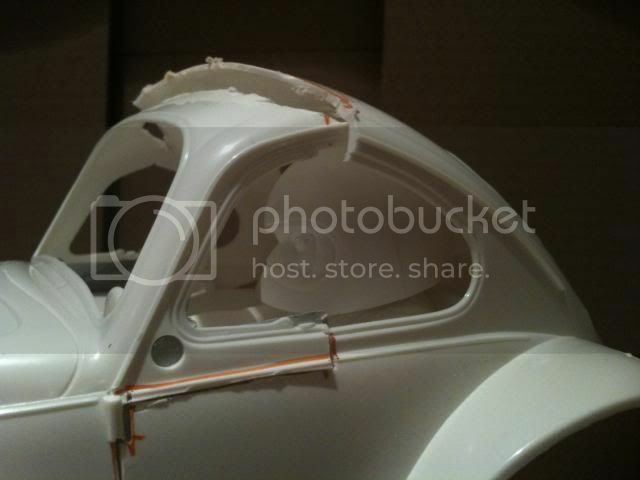 I also spread epoxy over the inside of all the welded joints, for extra strength. That I am hoping to be able to do a little later this evening... it could be another late night tonight! wow quick progress . Not quite what I had in mind but I have to say its very cute . I really like the way this has worked out, although I was/am also tempted to open up the whole back of the roof down to the vent panel above the boot lid - very much in the same was as the 1:1 in the photo XV Pilot posted - as it would really show of the interior, which would be fun... and perhaps include a folded/rolled tonneau like the old Citroen 2CV had? You know, with the angle of the front windscreen and the rear roof section, it kinda reminds me of an 80's era Porsche 911 from the side. I deffo think you should open the roof up like that 1:1 car, there's no way Willy's helmet would fit through any of the holes otherwise (ooer)! This is just plain awesome. Great idea, great work.